I am always amazed at how incredibly different my children are. They are raised in the same home, experience many of the same things, but they are as different as night and day. In order to help them understand, foster, and nurture this difference I looked into ways that they could learn about the different traits that make them unique. PeopleKeys offered me a free personality test designed for children in exchange for a review on this blog. PeopleKeys has over 25 years of experiences designing personality assessments. Their evaluations have been used by employers, teachers, parents, and even children to understand different personality traits. I received the Children's Profile physical workbook to use with James. This workbook assessment is designed for children ages 9 to 13 and took James about 15 minutes to complete. How the assessment works is that it gives a situation or circumstance followed by a bunch of options. An example would be: "With something new" then the choices are: "I figure it out, I take my time," etc. The child circles the option that best fits what he thinks of himself. At the end you score the columns and find your dominant personality trait according to a graph. I really enjoyed completing this assessment with James. PeopleKeys encourages parents to be involved while their children complete the profile, and I believe it should be mandatory. It was really interesting to me to see how James views himself. I didn't not influence his choices; in fact I let him choose the answers completely by himself. I joined him upon completion and we reviewed the choices and the scoring. We then read through the remainder of the workbook together. There is no right or wrong personality style, and PeopleKeys does as excellent job of pointing out positive and not so positive traits in a child-friendly way. It can still be discouraging to a child like James who tends to be a more "half-empty" kind of kid. That is why I think it is so important for the parent to be involved in the discussion about the type. I could act as kind of a buffer and say things like "Knowing that you are not always attentive to details can help you when you are rushing through that writing assignment and then receive a poor score. When you are rereading your work you can think to your self, 'How can I make this better?'" I also liked that the profile offered tips to parents and caregivers about how to reach specific types more thoroughly. Offering encouraging criticism instead of just a negative comment is helpful in almost every situation. Instead of saying, "Make this longer," I can say, "I really like the bank robber character. Can you write more about him in your story?" No person or child is going to be solely one trait or another. In fact, James was so borderline between two traits it really could have gone either way. Each trait was discussed and we were able to see how different aspects of the four styles worked their way into his personality. Overall it was a unique learning experience that I would like to repeat with the other kids as they prepare to enter their teen years. I thought this was fun to do. I enjoy figuring out things about myself. 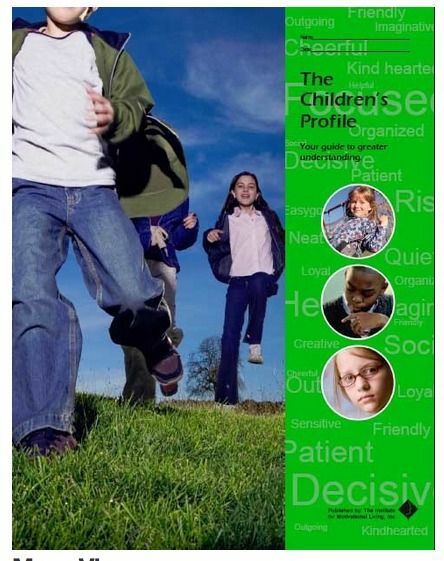 The Children's Profile is available on the PeopleKeys website for $15.00. In addition to the Children's Profile, the company offers more thorough assessments for teens as well as assessments based on different learning styles. I encourage you to explore the educational products that they have to see what would be the best fit for your family. Many other reviewers over at The Schoolhouse Review Crew received products from PeopleKeys. Click here to read those reviews, or click the banner below.